The hotel offers a restaurant. A bar/lounge is on site where guests can unwind with a drink. Public areas are equipped with complimentary wireless Internet access. This business-friendly hotel also offers a nightclub, multilingual staff, and laundry facilities. Customs House Hotel is a smoke-free property. Located in Hobart Central Business District, this historic hotel is within a 5-minute walk of Brooke Street Pier, Salamanca Market, and Salamanca Place. 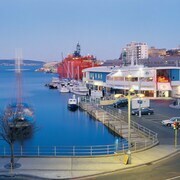 Constitution Dock and Hobart Cruise Terminal are also within 15 minutes. This smoke-free hotel features a restaurant, a nightclub, and a bar/lounge. WiFi in public areas is free. Other amenities include dry cleaning, laundry facilities, and multilingual staff. All 30 rooms provide conveniences like refrigerators and coffee makers, plus free WiFi and TVs. Hair dryers, showers, and phones are among the other amenities that guests will find. 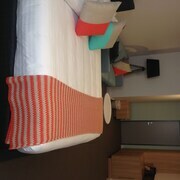 Customs House Hotel offers 30 forms of accommodation with coffee/tea makers and a hairdryer. This Hobart hotel provides complimentary wired and wireless Internet access. Bathrooms include a shower and complimentary toiletries. Business-friendly amenities include desks and telephones. Housekeeping is provided on a daily basis. Renovation of all guestrooms was completed in September 2016. Customs House Restaurant – This restaurant specialises in seafood and serves breakfast, lunch and dinner. Vue Bar – On-site bar.